Food & Beverage Profitability... Club industry data confirms that about 70% of all clubs subsidize their F&B operation. In this session, Club Benchmarking COO Russ Conde explains the true financial significance of food and beverage relative to dues and other sources of revenue. See how clubs across the country have shifted the dialogue in the boardroom and put an end to the F&B debate. Get the Facts. 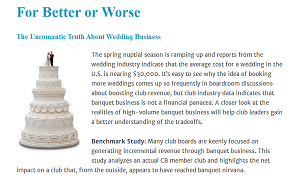 Subscribe to Club Benchmarking.